This year's Toronto Zombie Walk was great fun. We went as Zombie sea creatures of various descriptions. My costume was a shell and barnacle incrusted man based on a zombie version of William Turner. Details of the make up half way done. Barnacles and starfish are glued on with latex but not really coloured much yet. I put some black in my hair so it would not stand out where my hair shows. 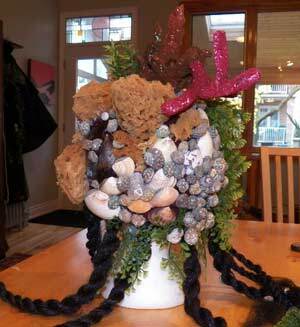 I glued on some barnacles and lots of shells. 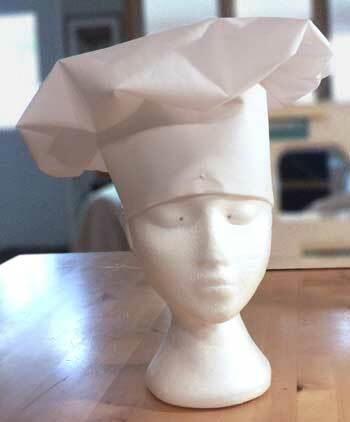 The base is a felt hat covered with a burgundy cloth and some fake hair. I had a real sponge that got shredded and glued on the base. I used hot glue and it worked well. I kept the headpiece quite small to show the make up better but it might have been more mysterious to cover more of the face. I had some cellulose sponges that I cut up with scissors and assembled as coral. I used acrylic to paint them dark orange and burgundy. Hot glue works well on these. Finally we had some fake plants from the dollar store that did well as sea weed. The week before I had got a couple dozen mussels and after eating them we kept the shells and added them to the costume in particular the coats. I kept the headpiece quite small to show the make-up better but it might have been more mysterious to cover more of the face. The first step is to make a model of the object you want to reproduce in latex. 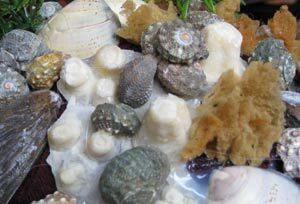 In my case I wanted barnacles in different sizes and I also wanted some starfish. I used Plasticine from the dollar store to make my models. I made several different sizes and some groups. I also made a starfish on a different board. The only thing you have to watch is to make your model so that there is not too much undercut. If you make a pyramid shape then the mould comes off easily when dry. If you make a ball shape, then it's difficult to remove the mould because the material has gone under and essentially ties the stuff in. Think of a cake shape. A muffin tin shape comes out easily. A ball shape would not come out at all. If you were looking for scars or wounds, then this is what you would shape in your plasticine. Once you have your model then you need to cover it with plaster. Use plaster of paris. It is often sold in hobby shops but also in the paint department of big stores. It is in the department that sells the spackling compounds and fillers. Mix up a batch which is thick enough and cover your models up to about a half inch larger. My models were on wooden boards so I had to oil the wood so the paster would not stick to it. Plaster will not stick to plasticine. After the plaster has dried which is about overnight in a small model then remove the plasticine. The plaster will set first but will still be wet, it will dry after setting. To make your barnacles, all you have to do is paint on the latex in the plaster shapes and let it dry. You will need to put several coats of latex for larger shapes so that they are stiff enough. It helps to inbed small pieces of single layer paper towel to reinforce larger pieces. Before removing the latex pieces from the mould, sprinkle some talcum powder or corn starch so that it does not stick to itself. 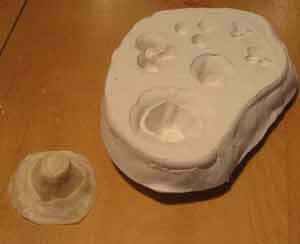 The moulds can be reused until you have enough barnacles or scars or third eyes or whatever you were moulding. When you want to stick on a barnacle just dust the latex barnacle so there is no loose powder, put some fresh latex on the edge and stick it to the clean skin, you can build up around the edge if it shows. You can use a hair dryer on low to set the latex faster. Be careful and check that you are not allergic to latex. Some people react to it and it can really irritate your skin. 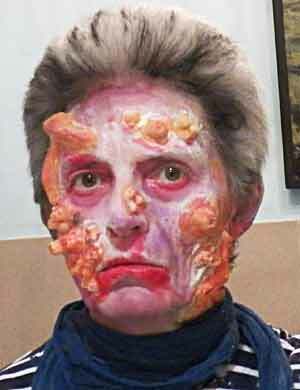 You can then use grease make up to colour your face and the barnacles and blend the latex in. A word of caution. Some people are allergic to latex. If you plan to use latex on yourself or anyone else do a test patch first to make sure it is not irritating. Latex bits are easy to stick on. A coat of liquid latex is put on the skin and allowed to dry. A coat is put on the clean barnacle and also allowed to dry. They are then pressed onto the skin and more latex applied to fill any irregularity. Make up then blends the edges. Get the position right because it cannot be repositioned. If you made a mistake you have to start putting wet latex on the piece and on the face, letting it dry again and trying again. If you stretch your face while the latex is drying then when the face is relaxed it makes great wrinkles. To remove I just pulled off and powdered the pieces to keep them from sticking. The latex dries and is quite strong, like a balloon or a condom. Your skin should be clean when you apply the latex with no grease of oil present. I don't think latex is great for the skin and it would be quite irritating if you had to put it on often. A bit or a lot of fake blood can be added. Nick glued a whole lot of tentacles to a rubber mask he found in the dollar store. It worked very well and looks great. 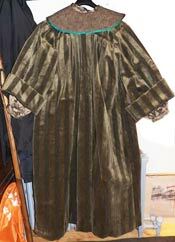 He glued lots of shells onto an old dressing gown and added fancy sleeves. 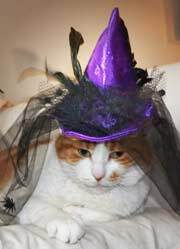 Add a belt, some fancy cloth and a pirate's hat. The mask could have been uncomfortable but it was cold out and it actually kept him warm. He added a shell mustache.